Red windows on a building in Shelburne. The little waterfront town of Shelburne offers visitors a slice of British colonial history and makes a good stop between Lunenburg and Yarmouth on Nova Scotia’s south shore. Its 2,000 residents hoped for fame when Hollywood arrived in 1994 to film The Scarlet Letter with Demi Moore but the film was a flop and today all that remains are a few buildings from the set. Shelburne’s prime attraction is its loyalist past. 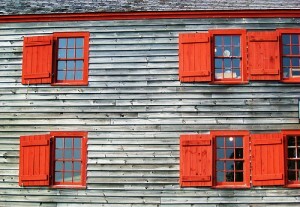 Over 15,000 settlers fled here from the American Revolution in the 1780s and many of the original wooden buildings they put up are still intact. A walk along Dock Street skirts the edge of the world’s third largest natural harbour. You can see craftsmen painstakingly making wooden barrels by hand and visit the Dory Shop, where they’ve been making the small boats since 1880. The Muir-Cox Shipyard, one of the oldest in Nova Scotia, is also worth a visit, as is the Ross-Thomson general store, set up as it was in the 1820s, and the Shelburne County Museum. All of these sites are part of the Shelburne Museum Complex and entry to the works is $8. A couple hours in Shelburne should suffice, unless you’re very interested in marine history. Shelburne is best visited in the summer. Many attractions close outside the peak visiting months of June to September. The tourist information office is at the north end of Dock Street, next to the barrel maker, and can help book accommodation in one of the town’s many B&Bs. Camping can be found in the nearby Islands Provincial Park.